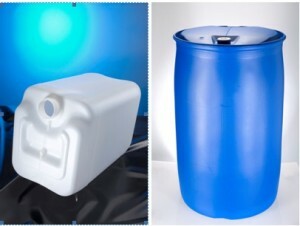 Total specifically developed XSene 55060, a unique bimodal high density polyethylene, as a direct response to the demands of the Industrial Packaging market. Based on Total’s proprietary XSene technology, the next generation 55060 was specifically designed to offer increased rigidity and therefore to reduce weight, without compromising the performance of the end product. AST Kunststoffverarbeitung GmbH, a producer of plastic containers and drums for the chemical, oil and food industry, approached Total to increase its product range to meet the demands of the chemical industry. Total proposed XSene 55060. XSene 55060 is an advance in downgauging for the industrial packaging market and meets the industry need for easier processing, higher performances, and lighter weight solutions. It also offers the advantage of increased sustainability thanks to the reduction in raw materials use and lower extrusion temperatures. Total’s advanced dual loop technology enables versatility in product design, bringing a combination of improved product qualities. These include excellent and consistent processing on standard extrusion lines, cycle time reduction and potentially lower extrusion temperatures. The outstanding Stress Crack resistance offers excellent resistance to aggressive chemicals and allows downgauging up to 10% versus comparative materials.